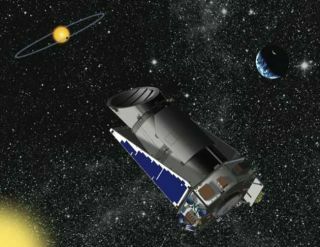 A new instrument being built by the Harvard-Smithsonian Center for Astrophysics for use in the Canary Islands will help NASA's planet-scouting Kepler spacecraft confirm and characterize potential alien planets. The Harvard-Smithsonian Center for Astrophysics, in Cambridge, Mass., is involved in an international collaboration to produce a new precision spectrograph instrument, called HARPS-North. "HARPS" stands for "High-Accuracy Radial velocity Planet Searcher." This spectrograph is designed to detect the tiny radial velocity signal induced by planets as small as Earth if they orbit close to their star. "The Kepler mission gives us the size of a planet, based on the amount of light it blocks when it passes in front of its star," said Smithsonian astronomer David Latham. "Now we need to measure planetary masses, so that we can calculate the densities. That will allow us to distinguish rocky planets and water worlds from ones dominated by atmospheres of hydrogen and helium." NASA recently released a stream of new data from the Kepler mission that significantly increased the number of potential planets found outside our solar system. Kepler has already discovered more than 500 alien planets, but in the newly released data, the spacecraft also identified 1,200 planetary candidates for further study. The number of known alien worlds could double if most of the candidate exoplanets from the new Kepler data are confirmed. But confirming the planetary candidates remains a challenge. In some circumstances, an eclipsing binary star can mimic the shallow dimming of light from a planet crossing in front of its star. Ground-based measurements are needed to verify an orbiting world by spotting the gravitational wobbles it induces in its host star, in a method known as radial velocity. A spectrograph operates by splitting the light from a star into its component wavelengths or colors, acting much the same way as a prism. Chemical elements absorb light of specific colors, leaving dark lines in the star's spectrum. Those lines slightly shift position due to the gravitational tug of an orbiting planet on its parent star. "HARPS-N will pursue the most interesting targets found by Kepler at a level that no one else in the world can do," said Dimitar Sasselov, director of the Harvard Origins of Life Initiative, a research center that studies everything from planet formation and detection to the origin and early evolution of life. "HARPS-N will partner with Kepler to characterize worlds enough like Earth that they might be able to support life as we know it." The HARPS-North instrument will duplicate the design of the original HARPS instrument, which operates on the 3.6-meter telescope at the La Silla Observatory in Chile. HARPS-N, however, will make use of more-advanced technology currently under development, such as a laser comb for wavelength calibration, which will allow it to detect subtle radial velocity signals. The new instrument will be installed on the 3.6-meter Telescopio Nazionale Galileo in the Canary Islands, off the northwest coast of Africa. From this Northern Hemisphere location, HARPS-N will be able to train its eyes on the same patch of the sky being studied by the Kepler spacecraft – within the northern constellations of Cygnus and Lyra. "We have set up an enthusiastic collaboration among various institutions to build a northern copy of HARPS," said HARPS-N principal investigator Francesco Pepe of the Astronomical Observatory of Geneva. "We all expect HARPS-N to be as successful as its southern 'brother.'" First light, when HARPS-N takes its first measurements, is expected to occur in April 2012.